Certainly one of our prime motivations for getting a “proper” place to live in over here was to get a sense of home within an entirely different culture/environment. To varying degrees we’ve realised that aim, although I wouldn’t for a second try to suggest that an expat apartment in a nice neighborhood reflects much of real life in Buenos Aires. What didn’t specifically occur to me is just how useful an experience it is to relax at home, when “home” is entirely different to what you’re accustomed to. You simply can’t do it when you’re traveling in the regular sense. Party hostels, cafes, beaches, museums, nice hotels, parks – there’s an endless list of distractions for the traveler. As much as we love visiting them, we can never truly feel relaxed in these essentially public places. No matter how fast the Wi-Fi. Today’s “home” life involved collecting a vast assortment of cheeses, meats, wine, and preparing for our visitors tonight. Sitting on the beanbag on the terrace chatting to family on Skype, listening to those hissing buses pass on the street. Reading about Cristina Kirchner, set to romp in the presidency after votes are handed in tomorrow. More than anything it was getting back after a couple of weeks exploring the icy terrain of Patagonia – having somewhere familiar to go, having a key, and a bed you’re used to. No checking in, no currency exchanges, no hefting luggage up 3 flights of stairs. Truly decadent. Chile has 214, 000 dogs, half of them are homeless. 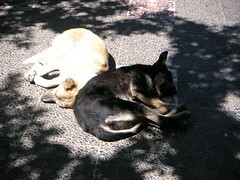 Chile doesn´t have a dog pound and no dogs are euthanased. Instead people or groups of people look after them. Everywhere you see bowls of water and sometimes little houses and blankets left out for them on the street. 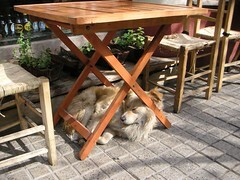 The other day I found a cute dog sleeping in the morning sun under a cafe table, so I took a photo. The waitress came rushing out saying something in Spanish about “photo”. Seeing the dumbfounded expression on our faces she quickly switched to perfect English and asked us if we could email her the photo. She told us that she looks after this dog, feeding it, taking it to the vet and in her cute accent she said she “loves him”. Later that day when we came back for lunch we asked where the dog was and she told me that he was having a bath. I guess this situation works well for people that can´t have a dog at home. It wouldn´t work for me as they would all come home with me. As per the subject line… Very short because Im very lazy and cannot make this keyboard behave the way I expect it to. Mendoza Bit more laid back than BsAs, great food around, we cooked up the greatest steaks ever. Really. Amazing park and some pretty swanky neighbourhoods. Crap cycling through the wine region.. seriously, who came up with that ridiculous idea? Bears no resemblance to the Yarra Valley at all. The Andes Every bit as awesome as you´d expect. More amazing was that I still had EDGE data signal on my mobile for that facebook update I did at the top (2950m according to the GPS) Major dizzy head at the border crossing as we mucked around for an hour with customs. Santiago. Nice. Lot like Melbourne. Rich people, lots of money around, hence stuff is quite expensive. Melbourne prices a lot of the time. Great parks, but lots of smog because its, well, surrounded by the Andes. Business-like culture, stuff happens much faster than in Argentina. Meat not as good, coffee better when its not instant. Valparaiso Far too cute tourist town. Very nice, 24hrs was just about the perfect length of time for it. Felt like being inside an MC Escher drawing. Pichilemu We´ve hopped on the backpacker bus today, and arrived in Pichilemu the surfing hotspot. Not so hot this time of year, but amazing coastline. And some “black” sand. Nice. Looking forward to meat & beer. The Internet is Better On Holiday. Several months back I was keen to get mobile data (internet) access on a prepaid mobile phone account – and discovered that this is essentially impossible in Australia. In the UK in June I grabbed a prepaid Orange UK SIM from the supermarket, and GPRS / 3G data was enabled by default. It continued to work when I got home to Australia. Here in Argentina I grabbed a prepaid SIM (with a hostel address and my VIC drivers license number sufficing for the purchase identification). Sure enough GPRS (& faster EDGE data) works out of the box, and the pricing is quite excellent too. The ADSL we have at home here is 1024/256, for less than AU$15/mo. Economic differences make direct price comparisons difficult, but I do note that Internet access prices worldwide tend to reflect prices I’d expect in a fungible marketplace rather than the local cost structures that govern telco infrastructure. Any way you look at it, though, that’s cheap Internet. Imagine the capital costs of providing ADSL over copper lines that have encircled this city for 100 years, traversing ancient, labyrinthine buildings, and it’s all the more impressive. Of course, it could simply be a result of the same public policy that holds utility prices below their (rapidly rising) costs, resulting in power cuts that add plenty of ambiance to the parilla restaurants frequented by us foreigners. Which is unfortunate. You are currently browsing the jules.com.au blog archives for October, 2007.